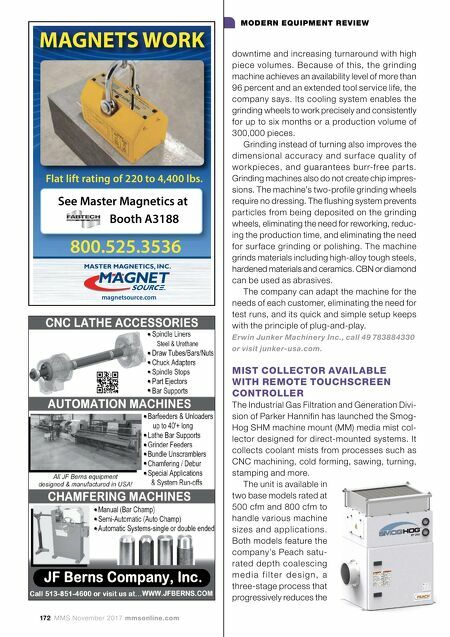 mmsonline.com November 2017 MMS 173 MODERN EQUIPMENT REVIEW mist concentration, resulting in greater than 99 percent particle removal efficiency. The 800- cfm unit is available in an advanced version with a remote touchscreen controller and EC blower, which is designed to simplify product operation and maintenance while delivering energy savings. The media mist collector includes ASHRAE 95 percent oil mist or HEPA safety af ter-filter options, various wall mount alternatives and a remote on/off disconnect switch. The product is available with additional options and accessories. Clacor Industrial Air | UAS, call 800-252-4647 or visit uasinc.com. 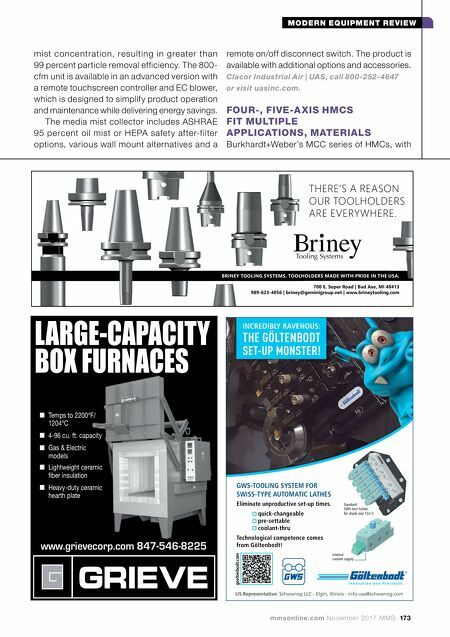 FOUR-, FIVE-A XIS HMCS FIT MULTIPLE APPLICATIONS, MATERIALS Burkhardt+Weber's MCC series of HMCs, with LARGE-CAPACITY BOX FURNACES www.grievecorp.com 847-546-8225 Temps to 2200ºF/ 1204ºC 4-96 cu. ft. capacity Gas & Electric models Lightweight ceramic fiber insulation Heavy-duty ceramic hearth plate US Representative: Schwanog LLC - Elgin, Illinois - info.usa@schwanog.com Internal coolant supply Standard GWS-tool holder for shank size 12x12 GWS-TOOLING SYSTEM FOR SWISS-TYPE AUTOMATIC LATHES Eliminate unproductive set-up times. quick-changeable pre-settable coolant-thru Technological competence comes from Göltenbodt! goeltenbodt.com INCREDIBLY RAVENOUS: THE GÖLTENBODT SET-UP MONSTER! 700 E. Soper Road | Bad Axe, MI 48413 989-623-4056 | briney@geminigroup.net | www.brineytooling.com BRINEY TOOLING SYSTEMS. TOOLHOLDERS MADE WITH PRIDE IN THE USA. THERE'S A REASON OUR TOOLHOLDERS ARE EVERYWHERE.